Betrayal Most Proper was an issue of Valiant's Nintendo Comics System imprint. While visiting the Mushroom King's throne room, Mario hears the king yelling at Wooster, saying he committed "treason" by "attacking the royal crown". The Mushroom King goes on to say that Wooster insulted and disrespected his recently bought crown, calling it an "abomination" due to its clunky design and neon lights. The King says that the only way Wooster could redeem himself is by delivering a humiliating apology, but Wooster simply resigns as the Mushroom King's adviser/assistant. Mario, realizing that the King won't be able to make any coherent decisions without Wooster, tries to rush after Wooster, but the King forbids it. Before Mario and the Mushroom King can debate the issue further, a battered Toad suddenly bursts into the room, saying that Wooster has just been kidnapped by Koopa Troopas. Hearing of Wooster's kidnapping, Mario decides to rush off and rescue him; unfortunately, the stubborn Mushroom King won't allow Mario or Toad to go rescue Wooster, believing that Wooster had willingly joined Bowser's side. The Mushroom King goes on to say that if Mario and Toad disobey him and go after Wooster anyway, they shouldn't expect to be welcomed back when they return. Deciding to work things out with the Mushroom King later, Mario and Toad make their way to a Mask Gate. After some off-screen journeying, they make it to Bowser's Castle, where they battle a multitude of Shyguy guards, with Toad taking a Shyguy hostage, planning on "throwing him at Koopa". 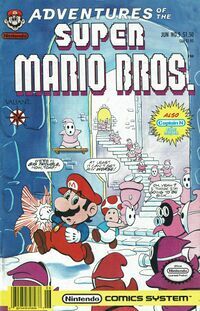 While traveling through the castle with the ever queasy Shyguy, Mario and Toad are surprised to see that none of the Shyguy, Snifit or Birdo guards are attacking them. Wondering why they've been met with such little resistance, Mario and Toad wind-up spying Wooster acting as Bowser's willing servant, feeding him a large amount of food. Despite Wooster's apparent change of allegiance, Mario and Toad still decide to go and rescue him anyway, and they begin fighting their way through a brigade of Shyguys, with Toad's unwilling Shyguy companion offering commentary all the way. It is only when Mario and Toad reach the entrance to Bowser's throne room that they realize that if they do "rescue" Wooster and take him back to Mushroomland, they'll be labeled as traitors by the Mushroom King. Disregarding this fact, Mario and Toad burst into Bowser's throne room, preparing for battle; oddly though, Bowser, along with all his bodyguards, are all asleep. It is only then that Wooster appears, saying that he had fed Bowser and his minions enough junk food to induce hibernation in them and make them lethargic. A joyous Mario and Toad, happy that Wooster was innocent all along, begin to head off to the Mushroomland with him, with Toad throwing his Shyguy hostage at Bowser's head for fun. It is only when Mario, Toad and Wooster reach the Mushroomland that Wooster begins to become resistant, saying he won't return to the Mushroom King's staff until he is appreciated more, and he still refuses to apologize to the King. Regardless of Wooster's decision, Mario and Toad drag him to the Mushroom King's throne room, saying that Wooster has "decided to apologize". In the throne room, Mario, Toad and Wooster are surprised to find the Mushroom King hiding fearfully from Princess Toadstool, who is angry at him for letting Wooster resign. A terrified Mushroom King runs from the recently appeared Princess Toadstool, crashing right into a broom closet. Seeing Wooster, Princess Toadstool happily welcomes him back as the Mushroom King is buried under a mountain of junk in the closet. This page was last edited on March 23, 2019, at 07:36.